Bring elegant comfort to your dining room with this upholstered caster chair. Crafted from steel and featuring a rich Roletta Brown finish, this chair has a shapely structure that creates a sense of resplendent grace to any room. With upholstered seat and seat backs, comfort is guaranteed, and a creamy tan fabric poses a complementary contrast to the metalwork. 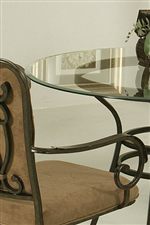 Scrolled metal arms add space for arm rests, and caster wheels offer easy flow to and from the dining table. Classically designed with a formal feel, this caster chair brings an upscale look coupled with comfort that is bound to perfect your dining space. The Vienna Upholstered Caster Chair with Scrolled Arms by Pastel Minson at AHFA in the area. Product availability may vary. Contact us for the most current availability on this product. Finish Features a rich Roletta Brown finish. Warranty One year warranty. All warranties apply to the original owner only and begin at the date of purchase. All warranties are to refinish, repair, or replace at factory discretion. Periodically styles of furniture are discontinued. Warranty does not include damage to paint caused by corrosion of metal or discoloration of fabrics, if any. Complete your dining space with Vienna. Traditional in style with an upscale feel, the Vienna collection makes it effortlessly easy to refine any home. Indeed, with this assortment, its all about the details. A glass table top, scrolled metalwork, and gentle curves all work to fashion a look and feel that is casual yet refined. Comfort and convenience are not forgotten, however, with features such as upholstered seat and seat backs and caster wheels. A rich Roletta Brown finish emanates a warmth that makes this collection entirely irresistible. Dine in comfort, dine in class - only in Vienna. 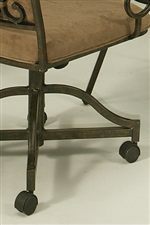 The Vienna collection is a great option if you are looking for Traditional furniture in the area. Browse other items in the Vienna collection from AHFA in the area.